It’s a time-honored tradition to sketch a design idea on the nearest piece of paper, such as the back of an envelope or a cocktail napkin. You then have to take that paper over to your computer and manually translate the sketch into a document you can take through production to final output. Today, with Adobe Comp CC on the Apple iPad, you can design layouts by sketching gestures with nothing more than your fingers. You can then send that design directly to Adobe InDesign CC, Adobe Photoshop CC, or Adobe Illustrator CC as a fully editable layout, ready for immediate refinement and production. The issue’s called Fresh Tips because it features a long list of genuinely useful InDesign productivity tips…I’m learning from them myself! 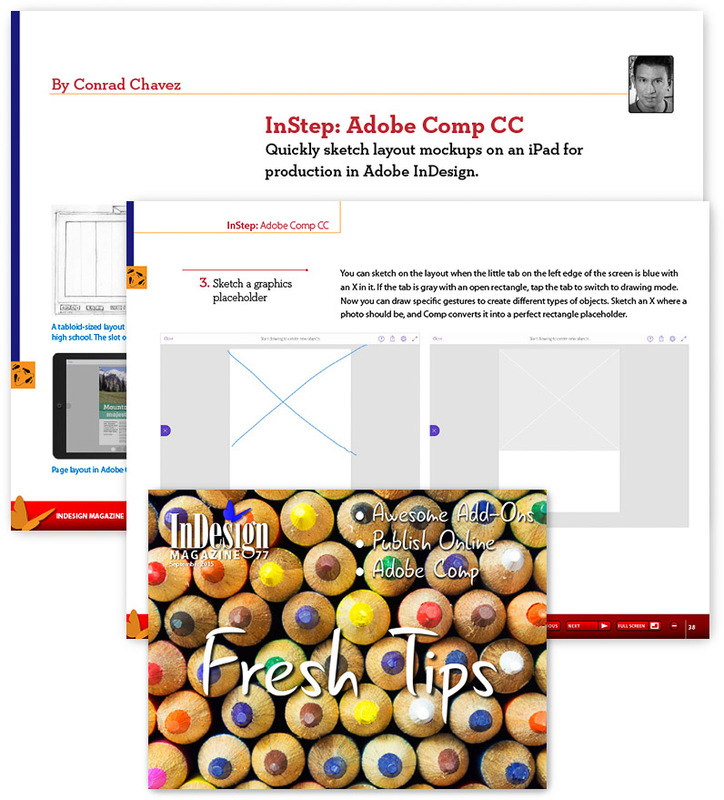 In addition to my article on Adobe Comp CC, the issue also introduces the new Publish Online feature in InDesign. The article is part of an issue of InDesign Magazine that you can buy as a single issue or as part of a subscription. You can download a free trial issue, and you can save $10 when you sign up for a 1-year membership by using this coupon code: friend.